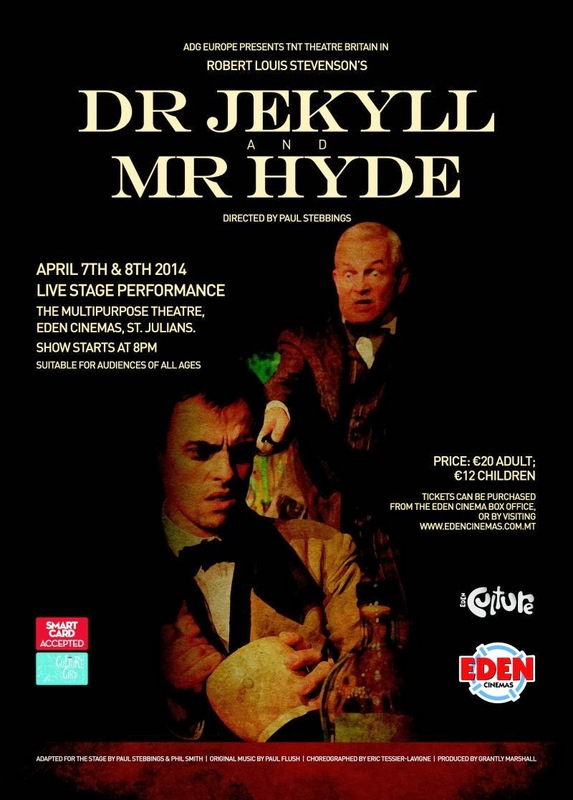 Eden Culture, together with the Eden Cinemas, are proud to present ADG Europe and TNT Theatre Britain, in Robert Louis Stevenson’s Dr Jekyll and Mr Hyde. Adapted for the stage by Paul Stebbings and Phil Smith, this fantastic production will be showing exclusively in Eden Cinema’s multipurpose theatre on the 7th and 8th April 2014 at 20:00. Suitable for audiences of all ages, tickets are priced at €20 for adult and €12 children. The Student Smart Card and Culture Card may also be used for the purchase of tickets. Being a wonderful opportunity for Maltese students to experience the stage adaptation of the original literary masterpiece, the Eden Cinemas will also be organising special school screenings between the 7th and 9th April, with tickets being sold at a discounted price. Produced by Grantly Marshall, together with original music by Paul Flush and choreography by Eric Tessier-Lavigne, the renowned tale of Dr Jekyll and Mr Hyde will be dramatized by the theatre company’s unique theatrical style, combining dynamic physical theatre with a film like score. Drawing on the style of Victorian melodrama, detective thrillers and silent film, such elements are sure to create an exciting production that will reveal the dark heart of the extraordinary novel.